This heavy-duty bench brings an inviting, modernized style to any outdoor setting. Back/seat is thermoplastic coated for protection against the elements and low maintenance. Powder-Coated leg frames provide durability. This commercial grade park bench features 2-7/8" O.D. heavy-duty legs. Grout covers are optional for in-ground or surface mount models. 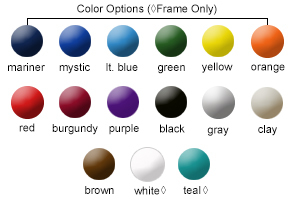 Multiple colors are available. 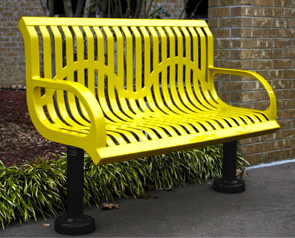 Bench back and seat are thermoplastic coated and is finished with lightly textured matte polyethylene in the color options shown.